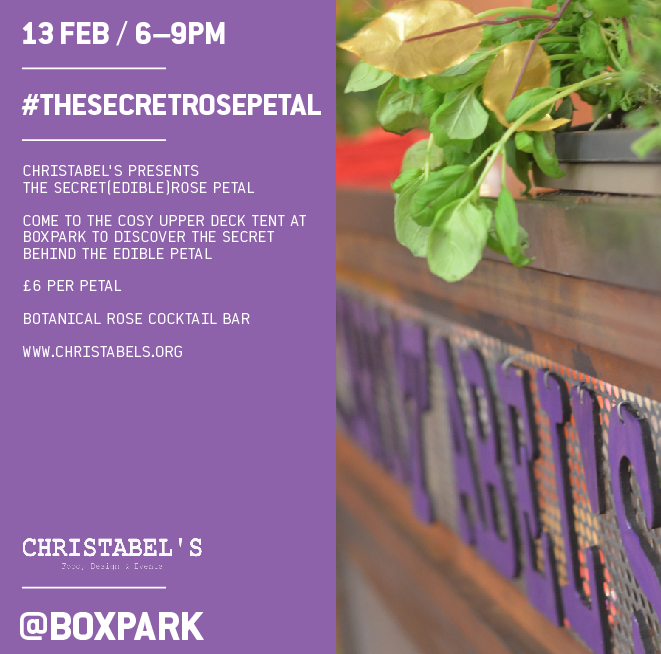 "Come and find us in the candlelit BOXPARK tent on Friday 13th February. Here, you will find out what lies behind the edible rose petal. At this exclusive Valentines event you will get the opportunity to set your taste buds alight with CHRISTABEL’S range of raunchy cocktails. The ravishing bar staff will be exchanging rose petals for mind - blowing concoctions. We would recommend the ‘Flirt’ - to wet your appetite - think botanically brewed rose lemonade, homemade rosemary syrup and gin - yuuhuuum. The bar features a growing rose herb garden, homemade herbal botanicals, a first class mixologist and a cutting edge design. In order to build the perfect flirty cocktail the CHRISTABEL’S team encourage you to pick your own herbs from the garden. Come, drink,and get flirty … "